Simon has been secretly emailing a boy he knows only by the name "Blue" for months now. They met through their high school's Tumblr page and have gone from flirtatious to super-romantic. When irritating classmate Martin stumbles across an email between the two, he uses it to blackmail Simon into fixing him up with his friend Abby. Although Simon is concerned about being outed before he's ready, he's even more worried about potentially compromising Blue's identity and any chance at a real-world romance. Everyone who told me that this book is great was right. 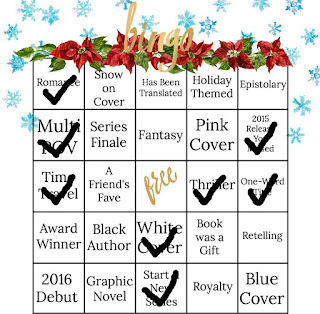 As with many really good books, it's hard to articulate why it's so good. It's much easier to rip apart a bad book. I think a lot of what I liked is how recognizable it all was. High school is so dramatic, and this is captured very well. Simon is kind of a terrible friend in a pretty typical way, in that he is so wrapped up in his own life and problems that he doesn't even think to ask people around him about what's going on with them. There are some pretty basic things he doesn't know about his close friends. The blackmail situation is, of course, quite distracting and Simon becomes involved in a lot of complicated situations of friendship, romance, and betrayal. Although Simon had a good relationship with his parents, he was also kind of aggravated by them. Specifically, they just made a big deal out of everything. Every time he did something different, they drew way too much attention to it. "I didn't know that you drink coffee now!" like it was something really extraordinary. Teenagers are changing all the time, and the last thing they want is for it to be announced and discussed at length. This really resonated with me because my family was the same way. Even in my 20s, my mother would take note of things and then not ever forget them. Like, when I got a tattoo of a frog she was all "I didn't know you liked FROGS!" and then for years proceeded to buy me frog-themed everything until I told her to stop. Anyhow, being genuine and realistic wouldn't be enough without the fun and romance. Simon was a theater kid at school and was in the high school's production of Oliver. He hung out with other theater kids, and was convinced (hoped!) that Blue was this cute boy named Cal Price who was also involved with Oliver. Speaking of Blue, their romance was really sweet and adorable, even though it was primarily over email. That of course also made it risky because every time they even imagined meeting, there was a lot of angst, but I loved their conversations and the way they understood each other and talked honestly to one another in a way they didn't with their closest friends. Plus, they were so nerdy together. During a discussion of Simon's use of sentence fragments, Blue admits that he loves them, and then Simon gets mock-jealous about other boys that Blue finds cute and says "You better not love THEIR sentence fragments." What is more adorable than grammar-based romance? 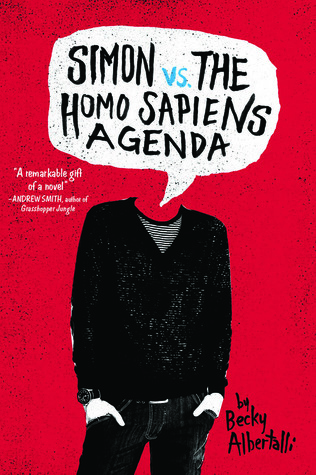 I really enjoyed Simon's voice and his observations and pretty much everything about him. He loves Oreos and has a dog named Bieber and has complicated feelings about cross-dressing, but feels compelled to always dress up for Spirit Week at school. He's been friends with Nick and Leah since they were little kids, but since Abby has joined their group and Nick obviously has a crush on her (as does every other straight guy at school) things have gotten a little tense. Simon knows that Leah really likes Nick and is jealous of Abby, but he doesn't know what to do about it. I really just wanted to help this kid out. Making Simon's voice even better is narrator Michael Crouch. He was the perfect voice for Simon Spier and really made the story come alive even more. This was a great audio choice! I'm so glad I finally got around to listening to this book. 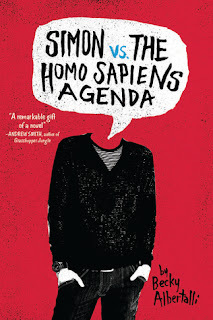 Anyone who likes young adult books should definitely check it out! 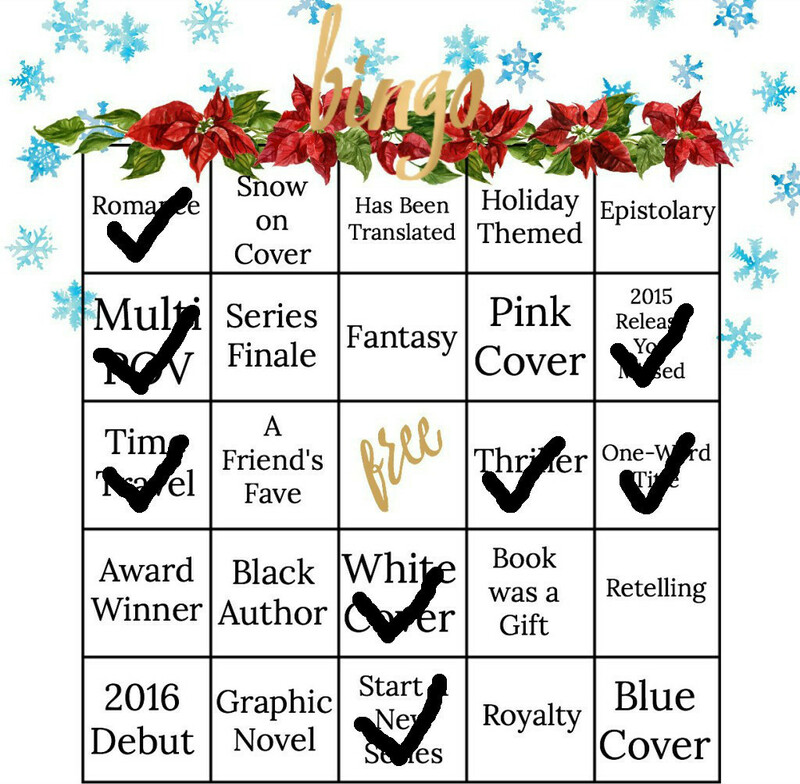 It also fulfills a square for Winter Bingo since it was a 2015 release that I missed.